What is Indoor Relative Humidity? Condensation on pipes due to high relative humidity. One of the most common basement problems is humid air that condenses and leads to mold growth. Relative humidity is the amount of water the air can hold at a given temperature. For example, an RH of 50% means that the air is holding 50% of the moisture it can possibly contain at that temperature. Once the RH gets over 100%, it rains. 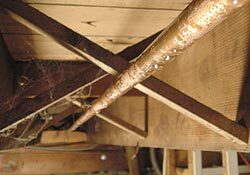 In basements, problems occur when warm air from the outside enters the home and is cooled. For every one degree air is cooled, the relative humidity is raised by 2.2%. So, say it’s 80° on a summer day with a humidity level of 65% - when that air enters your basement and is cooled to a typical basement temperature of 65°, the relative humidity level jumps all the way up to 98%. This is a major problem because ideal conditions for mold growth are anything with an RH higher than 70%. Additionally, when this air touches cold surfaces in your basement, such as unfinished walls or cold water pipes, condensation will occur. Even without condensation, we still get high relative humidity levels, which allow mold and mildew to grow and cause "stinky basement syndrome." What can you do to control relative humidity? The best way to control relative humidity in your home is with proper dehumidification. The SaniDry™ dehumidifier is 10-times more powerful than a traditional home dehumidifier, but uses the same amount of energy to operate. The high-performance dehumidifier and air filtration system is available in two versatile models - the SaniDry™XP and the compact SaniDry™ CX, which is designed to fit in tight crawl spaces. For optimum protection and humidity control in your basement or crawl space, a waterproofing system should also be installed to eliminate standing water and water vapor transmission.